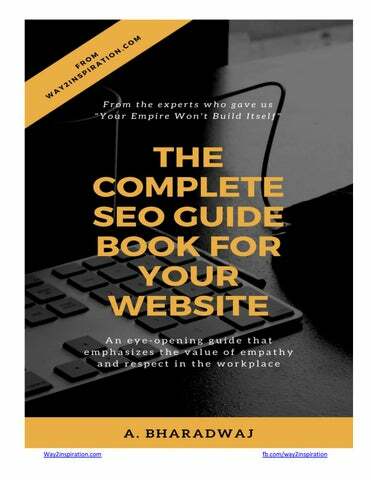 A book by A. Bharadwaj (Founder of way2inspiration.com) This book can definitely help the internet marketers who are struggling to rank their pages on the top of the SERP and also who are new to the field of Digital Marketing. I have covered almost all the topic in brief. For further queries you can visit our company blog for more reference. You can contact our team for any query and to learn SEO. SEO is evolving day by day and search engines are getting smarter. A search engine which works as the mediator between the human and the web content on the internet. All the technologies like SEO, SEM, SMM serve as the catalysts to help the right contents to reach to the right people. Sundar Pichai the present CEO of Google is working on Machine language development with Artificial Intelligence to make it the majestic search engine in the world. The day is not so far when you think about booking a movie ticket and within a second the results pop up in front of you. That’s why the technical experts are working day and night to develop algorithms making these technologies to perform well to help people in getting the perfect results. SEO is helping many big brands as well as small businesses to grow their online businesses. That’s why every business wants to rank their page on the top of the search engine. And it has helped SEO to grow as a billion $ industries around the world. In the SEO industry millions of jobs are created every year, as it needs man power and time to optimize contents. Think of the content which is in the unaware stage. When you want to release it to people then you need to publish it on a website. To make it live you need the promotion by various ways. Every online business needs website and the website needs SEO. Without optimization, a website is almost dead. SEO can make a site live. The career in SEO is bright with the boom of digital marketing and online business, e-commerce portals etc. The ways of promotion are two types: one is the free method and another is the paid method. The free method takes time and you can’t always guarantee. But once the traffic comes then the readers’ growth may accelerate. This is called the SEO. But the paid methods are the SEM or Google Adwords, facebook marketing etc. It gives you the immediate leads but the readers’ growth rate goes down as soon as you stop investing money. The phenomenon is simple: if you don’t want to invest money then invest your time. So now the question comes what should you do, free or paid? There are millions of content uploaded everyday and billions of websites exist on the world wide web. If you are serious to grow your business then you have to do all the methods whatever possible. You can initially boost your content by paid marketing and then wait for some months to get it ranked by the search engine. That is the reason this industry needs more SEO and digital Marketing professionals. 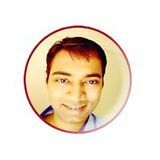 My short story: Introducing myself I am A. Bharadwaj, founder of way2inspiration.com. I have 7 years relevant experience in the field of web marketing and SEO. I have started my career in Search engine optimization and online marketing as a passion. It’s not only my job but I get extreme pleasure when I am able to rank the pages on the first page of SERP for particular keywords. This passion has made me an internet marketing and SEO expert. Still far I have helped hundreds of businesses and companies by our service. And you know when you love your passion it becomes a boon for you. I ranked my first keyword for ‘beginners advanced SEO guide’ in just 2 hours and it was a great day for me. The great thing was it got ranked above the top SEO blogs like Moz and Quicksprout. And when you rank your first keyword so fast the joy you get is unexplainable. It sprouted my confidence level and after that I have never looked back. These 7 years I have got the amazing experience. I have been learning while working, as technology is changing day by day. I have also failed a number of times in ranking some keywords which were highly competitive and got ranked some highly competitive keywords in 4- 6 months. I belong to a rural area, where the internet was once a dream. I moved to town to learn Web marketing in 2007 and joined an online course. But I couldn’t get a complete knowledge. The lack of internet facility couldn’t stand on my way to becoming an SEO expert. What I have learned so far is, SEO is based on 3 pillars: Authority, relevance, and trust. SEO helps the search engines to search the best results that users want. Google works as a mediator between content and users and it helps them to give the best results based on authority. There are two types of user categories: one who has in-depth knowledge about a subject and another who are in the unaware state. The first category people help the second category to give them the right information using technology. Technology helps people to get the right information by saving their time. This is the basic concept of Search Engine Optimization. Improve mobile optimization for SEO: The mobile and smartphone users are increasingly rapidly and at the end of the decade, the maximum searches will be from smartphone devices. Due to Googleâ&#x20AC;&#x2122;s constant updates to the mobile algorithm (mobilegeddon), mobile optimization is mandatory for your site. Mobile app indexing, AMP (accelerated mobile pages) are the factors for your ranking on various devices. If your pages are not loading faster then it may get hurt by this update. According to Google, more than 20% of queries are from voice searches. Due to increasing in voice search it is essential for a site to be loaded faster. The aim of Google is to create artificial intelligence system, which will be completely operated by human voice. As technology is developing it will be user-friendly and function according to user requirements. Page loading speed: In the world of internet users are really very busy and they usually have the tendency of multitasking. You have to attract and catch their attention within a second. Because there are a lot of options for them. If you donâ&#x20AC;&#x2122;t provide them what they need then there are many sites who feed their need. Page loading speed is an important factor in SEO. The average page loading speed should be less than 4 seconds. You can take the help of Google page insight to fix the problem. You can compress the image or use page cache to boost the loading speed. 4 Domain factor Domain age, history, exact match domain important strategies. Old age domain holds the authority than new age domains. Similarly, exact match domain may be a factor if it is a good quality site. Low-quality site may get affected by EMD update. Getting links from country specific top level domain extensions like .uk, .cn can help you rank better. Content optimization: Do a deep research before writing a piece of content. Dive deep into the topic related to the keyword and industry. Create a content that can entice readers and drive traffic to your site. That is called an original piece of quality content. Instead of publishing a couple of boring content publish 1 quality content per month. Create an expert piece of content which has never been published before. In this way, there are chances of your contents becoming viral and people link and share your content. But the question arises how to write an expert piece of content? Most content writers don’t have experience in a topic and they write an article by following other sites. In this way, you can’t create an expert piece of content. No doubt content marketing is the modern name of SEO. If you build a good quality piece of content that can give the valuable information what users search then it will be auto-promoted. Content length is one of the factors as search engines consider rich word contents as the authority and are ranked quickly on SERP. Avoid duplicate content as your site will get hit by Panda update. You can use ‘Rel= canonical’ tag to avoid duplicity of the content. Check the grammatical errors of your content as poor grammar and spelling decrease the quality score of your page. Keep a standard length of content 1500- 3000 words. As a beginner, you can restrict the length within 1000 words. Stuff the keywords in the first and last paragraph of the post. But don’t repeat it more otherwise your content will not be ranked. Stuff the keywords properly in URLs, Titles, Headlines and subheads. Restrict the title length more than 77 characters. Put your keyword at the beginning or middle of the title. Stuff the keyword in the Alt text of images. Stuff the main keyword as well as related keywords in the Meta description. Apply Bulllet, Numbering, underline, bold, italic to important lines. Internal and external links are essential to boost the on page SEO score. Build strong internal links by anchor text to different pages and posts. Similarly, link to external web pages related to your content. In this way, search engines think that your article is based on a good overall research. If your content is based on ‘Industrial Safety for accident and hazard prevention’ , then link to the top blogs related to industrial safety niche. Insert LSI keywords: LSI keywords are the synonyms of the keywords you have chosen. Using these keywords in your page and meta tags you have a chance to rank for these keywords also. You can get these keywords in Google suggest. 6 Proper Keyword Research for SEO: The success of SEO depends on the proper Keyword research and analysis. So can you guarantee that, a keyword you have chosen be ranked on the top of the SERP? Absolutely not. It depends on various factors and Google algorithms. But if you seriously follow all the rules of SEO and do a good competition analysis the chances of ranking are higher. Nobody knows what are the changes made in the algorithms everyday. The only way is, work on various SEO projects and follow top industry blogs. By continuous learning and working on SEO you will deeply understand the factors of ranking. Before choosing the keywords to categorize your products and services. Suppose you have an e-commerce site and you are selling various products like shoes, bags, apparels. In the shoe category, you divide it to men’s shoes, women’s shoes, children shoes. Then do the keyword research according to various categories. If you are serious about ranking your pages on the top for some particular keywords, then you have to work on a niche. First, you decide the niche you wanna carry on. As I have told you earlier SEO is based on authority. Suppose you are working on health then, the more contents having the keyword related to ‘health’ give you more chances of ranking the term ‘health’ on the top. As search engine considers it as an authority site based on the ‘health’ niche. You have to know the buyer personas and which types of keywords they are searching. As people depend on Google for good quality information, you will get most of the traffic from it. When people do an in-depth research they also search deeply and repeatedly on the topic to get more and more information from different websites. That’s why, I say before doing keyword research know how users search the keywords and can it bring enough traffic to your page? Then you need to know the competition of the main keywords and its synonyms. So now the question arises how to choose the proper keyword? Keywords are based on queries. The queries are mostly two types: transactional and informational. Transactional keywords are: buy, transfer online, review etc. Information queries are: how to, why, when, what, guide, tutorial, learn online etc. Are your buyers searching these types of keywords? Start your keyword research from Google trends. For example, choose a short tail keyword and move towards long tail. Like SEO, SEO service, SEO service in USA, SEO service in texas. You can get a clear volume of monthly searches as well as the locations. Then move to Google and type the keyword. While typing the keyword Google suggests you the keywords mostly searched. At the end of the page, you can get the suggestions related to your keywords. You can try the keywords one after another and check the average monthly searches. But here the research is not over yet. Copy the selected keywords and head over to Google Keyword planner. It is a free tool but you can also use Alexa tool, Hubspot tool for better results. The competition is 3 types: low, medium and high. So which should you choose? Obviously the low without any dilemma. But you can take medium and high in some cases. If you have a good team of SEO then you can target the high competitive keywords and outrank your competitors. But choosing the low competitive keywords can give you more chance of ranking higher. Keywords optimization Fresh content Content quality Content Length On page score Numbers of Back links Numbers of unique visitors per day. type all the details of your competitors. Then type all in details of your website and do a proper analysis to make the improvement. 301 redirection: If you want to change the page URL to different one without losing the link juice to the page, then you have to redirect it using 301 redirections. In this way, your page will not be considered as a duplicate page. Rich snippet: The Rich snippet can boost your page rank. Don’t use this for simple blog posts unless it is based on products or service. Local SEO: If you are running a business locally then a comprehensive local SEO strategy is mandatory. Google gives local searches more priority for a particular region. Do a good competitors' analysis with market research before doing Local SEO. Do the Keyword research properly and track your competitors’ pages ranking for those particular keywords. Check their backlinks using tools like majestic, semrush etc and build the links. Submit your site to local directories, Google business page, Bing business page. Genuinely submit your address including phone number. Global SEO: Global or international SEO is based on targeting countries and languages all over the world. Country code top level domains or cctlds are the most preferred option for international SEO. It is impossible for everyone to afford hosting costs for multiple countries. For targeting multiple languages use language meta tags properly as: <meta http-equiv=”content-language” content=”en-us”> International SEO or Global SEO can give your webpage more exposure to world wide. Using this you can improve the website traffic faster. 10 Link strategies: The web is based on links only. Link building is not only getting links from a site but also building the relationship with different people or site owners in your industry. Good quality links are the power of SEO. It not only boosts the ranking but also improves the authority of your site. Generally links are generated based on Page rank and domain authority of different sites. High PR and do follow link building are best in practice. Never buy or exchange links as it is considered spam now-a-days. Build one quality link instead of 100 low quality links. There are two types of links: Do follow and No follow. Do-follow links are the links which search engines give more priority than no-follow links. But both types of links you have to build to improve the page rank of your site. Links building from .Gov and .Edu sites hold high value by search engines. You can build links by various strategies like blog commenting, forum commenting, guest blogging, social bookmarking, web 2.0 submission, directory submission, etc. Social bookmarking are easy link building methods but most of these sites give no follow links. Before submission of the link check the PR, DA by using SEO quake tool bar or you can simply type â&#x20AC;&#x2DC;High PR blog commenting sitesâ&#x20AC;&#x2122; and you will get the best results. 10 Disavow low quality links: Keep in mind penguin 4.0. More links are not the ranking factors now a days. Now good quality and authority links are given priority than low quality links. To make your site safe from penguin 4.0 you have to focus on following white hat SEO techniques and avoid buying links or creating links from low quality web 2.0 sites. You have to avoid link exchanges and try to build link to your inner webpages instead of only home page or site. Analyze the links from your webmaster tool and check the PA, DA one by one. If your competitors have spammed your site by low quality links then disavow these links. Social share: The more number of social share can elevate your page rank easily. You can promote your page on facebook, LinkedIn using paid marketing methods. The search engine algorithms consider more social shares as a valuable informative content. SEO Audit: Ranking and tracking of the page performance can be done by a proper SEO Audit. You can do this manually as well as automatically. You can use automation tools like Grader tool, Webceo, semrush, similarweb, squirrely SEO audit to get the detail report.